Four mass communication students at Nanyang Technological University have turned their final-year project into a full-blown community campaign. They call it the ˜Project Tooth Keeper. The four 23-year-olds aim to promote oral health awareness among parents of children up to 6 years old. “We are learning how to advertise and market products and services [in our course at NTU]. So why not use that skill and do something for the community?” asks one group member, Susmitha Changaroth. In partnership with the Singapore Dental Association, Nina Zainudin, Susmitha Changaroth, Emily Ho and Grace Chow have gone from pre-school to preschool to reach out to parents about their campaign since January. They have visited six pre-schools to conduct storytelling to both parents and children. The group also says that many parents do not place much emphasis on their children’s milk teeth, believing the set of teeth will eventually fall out. The survey conducted by the group revealed that 162 out of 202 parents surveyed do not take their pre-school children to the dentist at all. One problem, the group says, is pre-schoolers are not provided with basic dental treatments during school hours like those in primary schools. At one of the pre-schools, a teacher says: “I think we are awfully lacking in this [individuals coming in to do community campaigns in schools]. There is a lot of information out there that would benefit the students, other than academic subjects. The teacher, 42, who only wants to be known as Jean, adds that many parents have rescheduled other work obligations in order to attend the storytelling sessions. 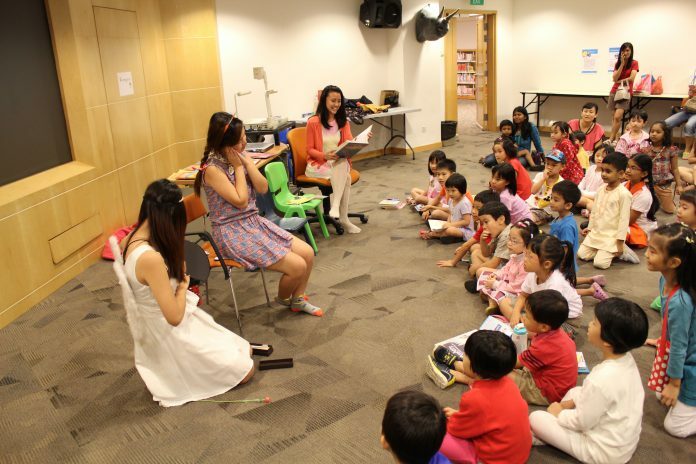 The number of students for each storytelling session ranges from 10 to 20 children. The group also says that the final year project is not restricted to community campaigns. Many of their peers- not all- are keener to launch campaigns that target the early 20s crowd. One such example is the group of students who launch ‘Put It On Friend Mode Day’ last December. The group entices people with discount vouchers to put their phones face down on the dining table. Project Tooth Keeper will hold their final event on March 9 at Woodlands Regional Library. Alongside carnival games, there will be paediatric dentists speaking on oral health for young children at the event.